It’s the 26th week of the year and the card of the week is the 10 of Pentacles. 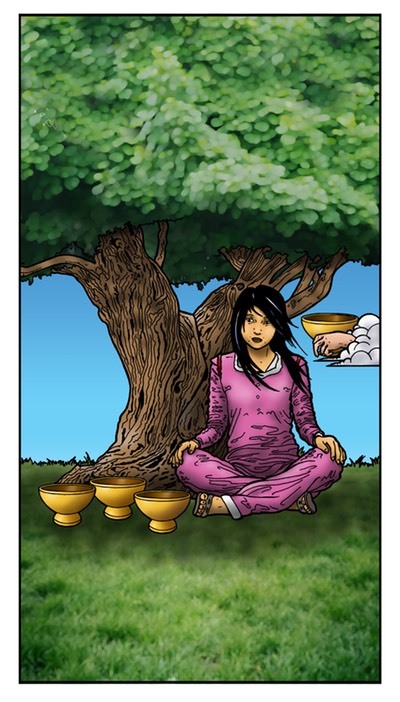 This is a card of a home blessed with prosperity. Whatever you are experiencing now is only going to work to create that prosperity for you. If you’ve been having a hard time, you’re not the only one. I’m having a really hard time from all this crazy movement in the galaxy and others are too. A lot of people have come to me lately and asked me why. “Tell me what’s going on in the stars, tell me why this is happening?” And that’s a big reason why even though I was on the verge of giving up Magdalena Tarot, I decided to continue. Because it helps people like me and you get through the storms but also realize when the stars have rewarded us for the pain that we’ve endured and karma we’ve paid off. Not to get personal, but I’ve had a lot of astrologers tell me that based on my chart, I came to this life to pay off huge karmic debts so I can move forward. I hope that if you’ve been watching the stars with me these past few years, you’ve seen the way the stars are leading you in a dance to righting wrongs you can’t remember you committed because they happened so long ago. So if you’re having a hard time, it’s because this particular period in the movement of the stars is meant to test us. And if you’re not struggling, you’re probably helping people who are which is also the opposite side of this dance we’re doing. 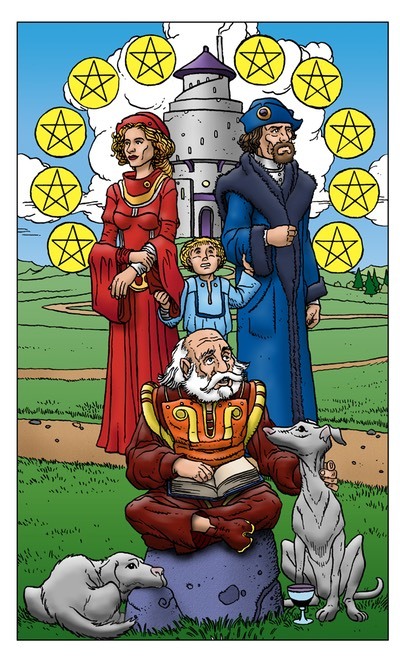 So it’s all going to be OK. We’re experiencing what we need to come home according to the 10 of Pentacles. And it’s the 8th week of the year, which is a number of – karma. Anyway, you’ll see what I mean. 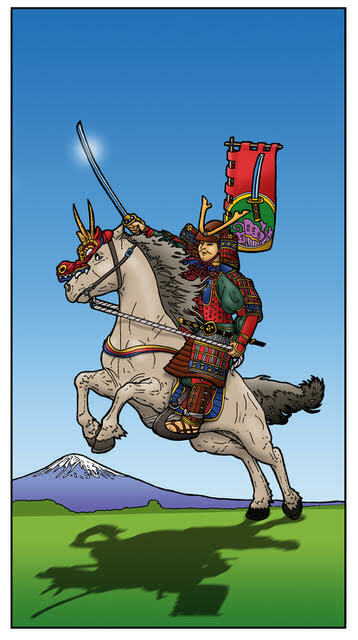 The 5 of Swords is a card of betrayal but also a card of acceptance of betrayal. Of all reasons relationships fall betrayal is the worst. It shakes your confidence and makes it hard to trust anyone again. Finding forgiveness for betrayal is hard. What kinds of betrayal are you dealing with today? Moon sextile Jupiter at 1:43 PM PST is a transit that contradicts the meaning of the card so today. It is happy, jolly and lucky like most Jupiter transits. The Moon is also in the strong sign of Leo, making it difficult for your pride to be hurt. And the number of the day is 6, a number of difficult choices. This appears to be a day that it will be favorable to approach someone you’ve been meaning to talk to that you’ve had a falling out with. But you must remain self-assured and confident so that they not only respect you but you respect them as well. However, the number 6 cautions to handle the situation with care. Mantra: Forgive and forget or forget but never forgive? 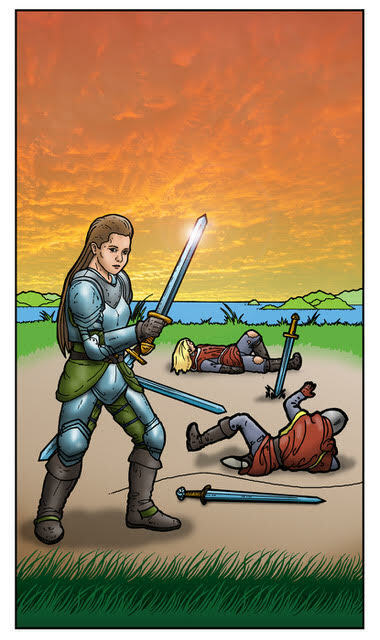 The Knight of Swords is a speedy guy who jumps right into things without really thinking about what he’s doing. He’s an air sign so his thoughts race and cycle rapidly. If you feel sped up, slow down today. It will help you avoid unwise decisions today. Moon square Venus at 3:29 AM PST is a selfish, lazy transit that may make you want to binge in order to cover up emotions you don’t want to confront. Don’t do that, face them head on. If you’re asleep during this transit, this theme may appear in your dreams. Moon trine Saturn at 6:38 AM PST will find you starting the day with a logical, can do approach to whatever you’re facing. Mercury trine Neptune at 5:23 PM PST will find your head in the clouds. It’s a good day for day dreaming. Leave processing to tomorrow. It’s also a good day to study the occult and the arts. You will find much inspiration in these subjects. The Moon starts the day in the shiny sign of Leo and then she goes void of course between 2:12 PM PST and 5:41 PM PST. Be passive during this period and let whatever comes your way happen. The Moon then enters the detail oriented sign of Virgo at 5:41 PM PST. Since this is around the same time that Mercury and Neptune hook up, this is very beneficial. This means that you will be able to really focus in on those daydreams that you have and sort out the details. The number of the day is 7 blessings things that start today for a plentiful harvest. You may not get *exactly* what you want but things will work out well nonetheless. The 4 of Cups is a card of introspection. The transits today may effect empaths the hardest. Moon sextile Sun at 6:03 AM PST is a transit of happiness, harmony and flow. Don’t lose that good feeling. Mercury conjunct Mars at 12:51 PM PST speeds up your thinking to the point that disagreements escalate without realizing. But you have the choice to choose your battles wisely. Moon conjunct Neptune at 6:58 PM PST is a transit that can bring feelings of guilt. If you someone jabs you in a soft spot, breathe through it and don’t let it get the best of you. Moon sextile Mars at 10:30 PM PST will find you recovering from any ego injuries by nighttime. Moon sextile Mercury at 11:44 PM PST is a transit of flowing communication. The Moon is still in the detail oriented sign of Virgo. Recognize what is necessary but don’t make a mountain out of a molehill. The number of the day is 7, a number of movement. Mantra: I stay still but the Universe keeps spinning. 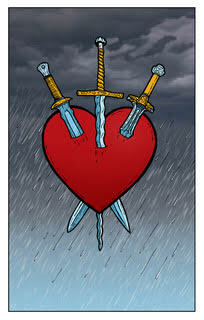 The 3 of Swords is a card of heartache. Be careful who you give your heart to because not many people are careful with hearts. Moon trine Pluto at 2:32 AM is a transit of intense emotions and sensitivity. Although it can be a draining transit, it also encourages you to live life with passion. If you are asleep during this transit the themes may appear in your dream. Moon square Saturn at 11:51 AM PST is a depressing transit that can bring high anxieties. Moon trine Venus at 1:34 PM PST is a transit that brings good feelings to you and those around you. Mercury opposition Pluto at 5:34 PM PST is a transit that warns you to beware of manipulation but it is also a good transit for being completely honest with yourself. The key to getting the most out of this transit taking control of your own mind. The Moon goes void of course in the picky sign of Virgo at 1:34 PM PST and will remain void for the rest of the day. Remember to be passive when the Moon is void of course. The number of the day is 9, a number of near completion. Mantra: The foundation of love is honesty. 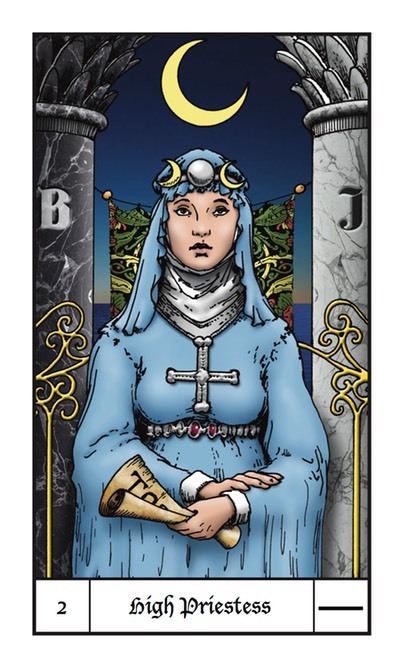 The High Priestess is a card of feminine wisdom. She uses her intuition when she needs to know the answers to life’s difficult questions. She is a reminder that the answer lie within you. The only exact transit of the day is Moon square Sun at 5:51 PM PST which brings the first quarter. You may be experiencing challenges to your New Moon goals at this point. The message the High Priestess brings is trust yourself. You know what to do. The Moon is in the balanced sign of Libra assuring you that your intuition will lead you to the most fair and just conclusion possible. The number of the day is 1(0), a number of endings becoming beginnings. Mantra: Know thyself, trust thyself. Mantra: You have the freedom to be in control. 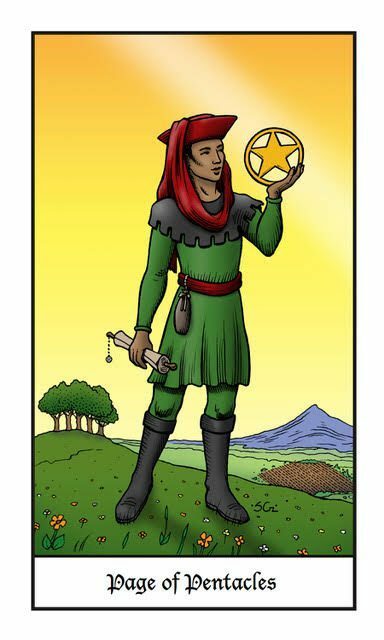 The Page of Pentacles is learning how to manifest what he wants. He is beginning to understand the power of visualization and the key to using it to see and live the future you want. This power will get you through this Scorpio powered day. Mars opposition Pluto at 4:58 AM PST is a make or break transit of interpersonal struggles, unethical behavior and ruthlessness. Spend time with people you trust today and avoid situations that could turn dangerous. The potential for physical violence is high today so avoid aggressive, angry people. If you feel aggressive or angry, you may need to get outside and spend some time alone in nature doing physical activity to curb your impulses and release the energy. Mars and Pluto both rule Scorpio and the Moon is in Scorpio for most of the day so beware of the Scorpio sting; it will be strong today. Moon opposition Uranus at 6:16 AM PST is an impulsive, exciting transit that can bring excitement but also more conflict. It would be best to spend today with yourself and focusing your energy on your won goals. This entry was posted in art, Astrology, dreams, Evolutionary Tarot, mysticism, mythology, Neptune Retrograde, numerology, occult, photo shoot, Pluto Retrograde, Saturn Retrograde, self help, spirituality, Tarot, witchy, Writing and tagged abundance, art, astrology, card a day, divination, dreams, empowerment, inspirational, magick, manifestation, mantra, meditation, metaphysical, motivational, mysticism, numerology, occult, pagan, predictions, psychic, self empowerment, self help, spiritual, spirituality, tarot, tarot reading, tarot weekly forecast, wicca, witchcraft, witchy, writing. Bookmark the permalink.